After trying to watch a very disappointing San Diego Chargers football game, I was so excited that I had to leave early and teach my Zentangle class at Paper Tales today! A group of eight ladies made their way to the store to take my “Beyond the Basics” Class, even though four of them were new. I struggled this week as to how to teach this class with both newcomers and returnees, but I managed to come up with a plan that I feel worked really well. As a new teacher of Zentangle, I’m thinking you have to go through a few trial and error sessions before you know how to just roll with it. My lesson plan was to teach the basic 1st tile using Hollibaugh, Crescent Moon, Static and Jetties. I didn’t teach Static or Jetties at my beginning class so I figured the returning folks would be getting two new patterns right there. And, when the class was over, they didn’t mind reviewing the first “tile” lesson anyway. I then spent about 45 minutes teaching some new patterns which they enjoyed. We just used a plain piece of paper and practiced the patterns that way. 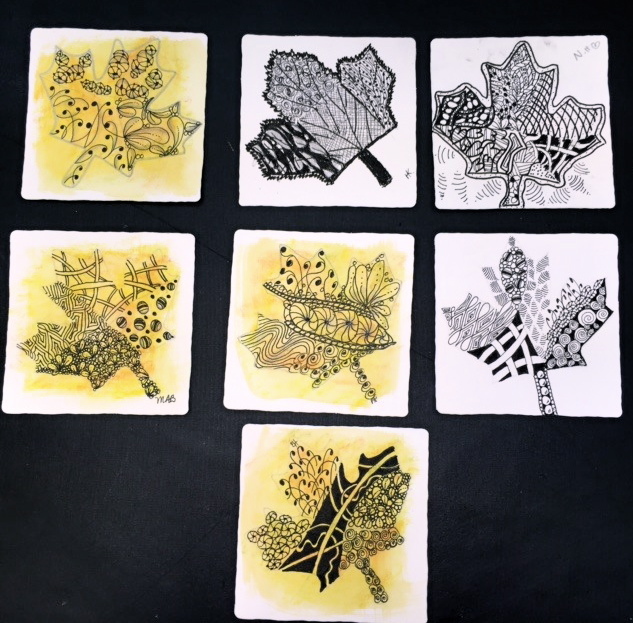 I then gave each of them (minus three) a pre-colored, pre-strung tile with my infamous maple leaf design! I had them divide the leaf using a string and use the patterns they’d learned to fill them in. It was a success! Now….lesson to the teacher….be sure and call even on the DAY OF CLASS to find out how many people have signed up. When I called yesterday, there were only four, but today I had eight. Thankfully, I was prepared with just the right amount of new and “2nd kits”. The only item I was short on was the pre-done maple leaf tiles. But, I did remember to take the pattern with me and we quickly made three up minus the color. Everyone enjoyed the class and expressed interest in learning more. That makes me feel really good! Thank you to the participants in todays class at Paper Tales. Be sure to keep checking their calendar for my next class. I very much enjoyed this post on your class,.Susan. Your students are creating outstanding Tiles. 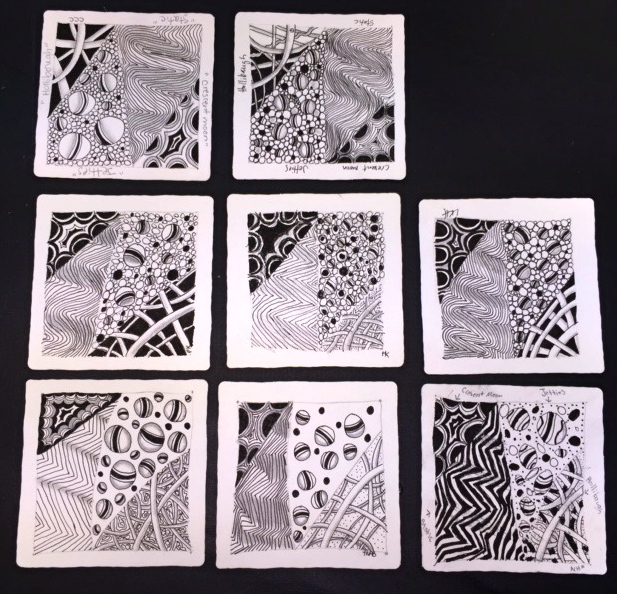 I hope your will post more reports of your Zentangle classes. Thanks for your efforts in teaching this awesome artform. Your going to be very successful.